Fescue is a cool-season grass suitable for growing in all parts of Kansas, though southern Kansas homeowners may find their fescue lawn invaded by Bermudagrass. OutsidePride.com recommends fescue grass for Kansas since it is tolerant of both heat and drought. This grass grows well in both sun and shade. Sow the grass by seed in the fall. OutsidePride.com recommends tall fescue, hard fescue, creeping fescue or Chewings fescue for planting in Kansas. Prepare an existing lawn for planting by moving lawn furniture off the grass and moving the existing lawn as short as possible with a lawnmower. Skip this step if you do no already have a lawn. Rake bare patches on your lawn using a hand rake, loosening the top one-forth inch of soil. Rake the entire lawn surface in this manner if you are planting grass on a dirt lawn. Correct uneven grade on your lawn by adding topsoil to low patches. Your yard will appear flat when your grass grows in over the topsoil. Skip this step if your lawn is already flat. 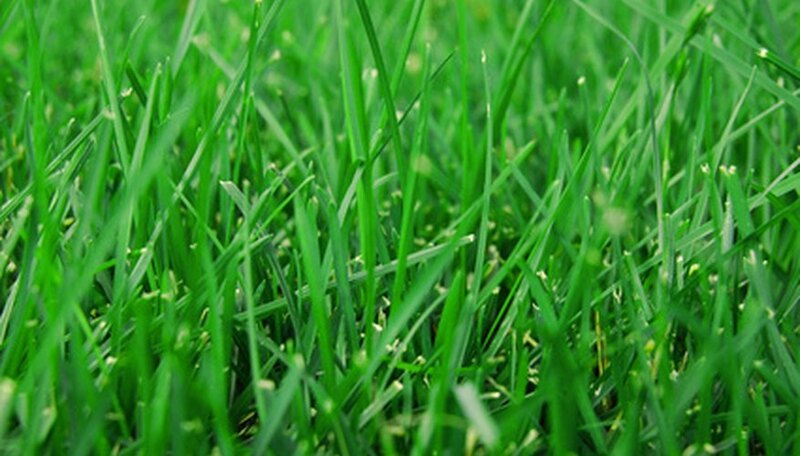 Sow fescue over your lawn, applying 16 seeds per square inch. Scatter the grass seed by hand or use a mechanical spreader, which you can rent from home improvement centers. Cover the grass seed with one-forth inch of topsoil if you planted the fescue over bare dirt. This keeps the seeds in place until they germinate. Do not cover the seeds if you planted over an existing lawn since the grass blades will keep them from blowing away. Water the fescue seeds until the ground becomes moist but not wet. Water every day until the seeds germinate and grow 2 inches. Then water once a week (less often if it rains) to keep your new fescue moist.